Distribution: Cuttlefish inhabit shallow tropical or temperate coastal waters, usually migrating to deeper water in winter. 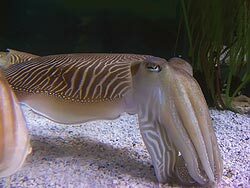 Description: Cuttlefish are marine invertebrate animals belonging to the Cephalopoda class (which also includes squid, octopuses, and nautiluses). Despite their common name, cuttlefish are not fish but molluscs. Recent studies indicate that cuttlefish are among the most intelligent invertebrate species.Cuttlefish are taken as a bycatch by Australian commercial fishermen, mainly in prawn fisheries. There are over 120 species of cuttlefish currently recognised. Cuttlefish typically only mate for the one season, two if they are extremely lucky. Ecology: The origin of the word cuttlefish can be found in the old English term cudele, itself derived in the 1400s from the Norwegian koddi (testicle) and the Middle German kudel (pouch), a literal description of the cephalopod's shape. Cuttlefish have an internal shell (cuttlebone), large W-shaped pupils, and eight arms and two tentacles furnished with suckers, with which they secure their prey. 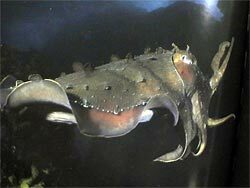 Cuttlefish eat small molluscs, crabs, shrimp, fish and other cuttlefish. Their predators include dolphins, sharks, fish, seals and other cuttlefish. Their life expectancy is about one to two years. Cuttlefish possess an internal structure called the cuttlebone, which is porous and composed of calcium carbonate, to provide the cuttlefish with buoyancy. Buoyancy can be regulated by changing the gas-to-liquid ratio in the chambered cuttlebone. Each species has a distinct shape, size, and pattern of ridges or texture on the cuttlebone. The cuttlebone is unique to cuttlefish, one of the features contrasting them with their squid relatives. They are often collected as the tough material is given to caged birds and snails as a source of dietary calcium. Interesting facts/Status: Cuttlefish are sometimes referred to as the chameleons of the sea because of their remarkable ability to rapidly alter their skin color at will. Their skin flashes a fast-changing pattern as communication to other cuttlefish and to camouflage them from predators. This color-changing function is produced by groups of red, yellow, brown, and black pigmented chromatophores above a layer of reflective iridophores and leucophores, with up to 200 of these specialized pigment cells per square millimeter. The pigmented chromatophores have a sac of pigment and a large membrane that is folded when retracted. There are 6-20 small muscle cells on the sides which can contract to squash the elastic sac into a disc against the skin. All of these cells can be used in combinations. Cuttlefish eyes are among the most developed in the animal kingdom. Scientists have speculated that cuttlefish's eyes are fully developed before birth and start observing their surroundings while still in the egg. The blood of a cuttlefish is an unusual shade of green-blue because it uses the copper-containing protein hemocyanin to carry oxygen instead of the red iron-containing protein hemoglobin that is found in mammals. The blood is pumped by three separate hearts, two of which are used for pumping blood to the cuttlefish's pair of gills and the third for pumping blood around the rest of the body.